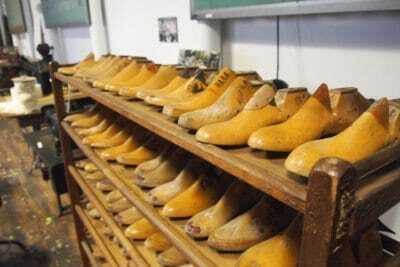 Shoe lasts on display with textile manufacturing machinery at the L-A Museum, Lewiston. We were biking a country road on a heartbreakingly gorgeous May morning with Phil Savignano, who spends his days in the state capital, Augusta helping to promote the Great state of Maine. “People without lobsters,” is how he described much of his state. “I like to represent those places that don’ t get as much attention,” he told us, as we pedaled past woodlots, pretty vistas and busy dairy farms. Lewiston is a perfect place to begin our tour of the Rest of Maine, unheralded yet full of optimists and big dreamers. While Lewiston/Auburn is a combined city of some 84,000 it has a small town feel. Everyone we talked to seemed to know of or know about everyone me had met or were planning on meeting. “Maine is my gym,” Phil continued, showing off his collection of more than 70 pairs of skis next to a fleet of bikes in his rambling country home near the town's lake. It was clear that we had met a 62 year old who could still out ski and out bike most of his younger peers. Why Lewiston? We chose this small city because it’s not hip and shiny Portland, and it’s not Kennebunkport, made famous as the Bush dynasty’s summer home. It’s not on a coast, and it’s not a place filled with tourists. But Lewiston, and its neighbor, Auburn across the river proved to be interesting places with lots to see and do. There are about 84,000 residents in the two cities of Lewiston and Auburn. In recent years this number has grown with a lot of immigration. 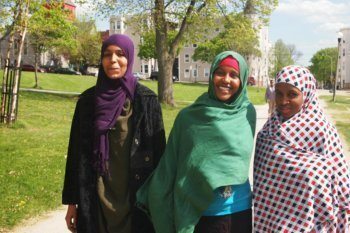 About ten years ago, a wave began bringing immigrants from Somalia to settle in Lewiston. Today there are about 3,000 Africans living here, and they have carved out a part of the city to call their own. The younger American residents here have no issues with the very different Somalis. The women wear brightly colored head-to-toe garb and many of the men can be seen chatting in groups and patronizing a section of Lisbon Street dotted with halal meat sellers, phone card stores and other shops catering to this significant African population. Many people told us that Somali children do very well in school and that most of the immigrants are no longer dependent on welfare. Like so many other immigrants who have come to this inland city, The Irish, the French Canadians, and the Italians, they have made their own mark and done well. Lewiston and Auburn (known as L-A) are lined with gigantic brick mills, that once housed a majority of the shoe making and textile production in the US. Today many of the mills are gone, but many others are in the process of being renovated and turned into offices and other businesses. TD Bank has taken over a large chunk of one mill and a fine restaurant, Fishbones, has been built in another. One of the biggest mills, called Bates Mill #5, is a favorite subject of debate and conjecture for many in the city. A group called Grow LA, headed by a young architect named Gabriella Russell, is looking for partners so they can transform this 365,000 square foot building into a two level solar greenhouse and server farm. They are open to other ideas but these are what the current plan looks like. 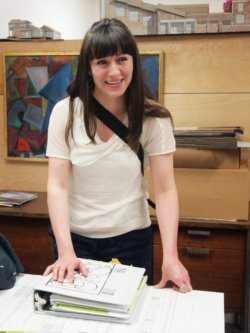 To get an idea of the history here, we toured the Museum L-A, with its effusive Executive Director, Rachel Delbrossiereiur. One of the first things she pointed to was a depiction of a the museum’s new home, on a tract of land by the river that will be built in the years ahead. Today the museum houses equipment once used to make bedspreads, and visitors can see each stage of the process from start to finish. It was obvious from the start Rachel holds a passion for her LA Museum. It soon became apparent why. Rachel, of French Canadian heritage, took us into a back room, past an "employees only" sign. Looking a bit like a giant dinosaur sat a colossal mechanical loom. Her father, she said, operated that very loom for over 30 years. He mastered the art of weaving beautiful fabric into bedspreads and he mastered the mechanics of operating this huge and complex piece of machinery- all the while never learning to speak English. She said that very loom will be moved to the new museum site. It looks somewhat like an organ but 20 or maybe 50 times larger and 100 times heavier. We asked how will they ever move it out of this mill? The answer as if it was obvious: take down the massive brick wall, use a giant crane and lower it from the 2nd floor to a waiting platform truck. I thought to myself: Now that is why we have earmarks in Congress. We enjoyed a very special dinner at the classy restaurant on Lisbon Street called Fuel. Our waitress could not have been nicer. She told us about her love for Lewiston, her new romance (the love of her life) and her proud heritage (Mic Mac Indian). We enjoyed talking to her so much I almost didn't care about the food. But the lamb shank melted in my mouth and the wine she recommended was a perfect match. The owner of Fuel, Eric Angren, sat down with us. He gave us an exciting account of the improvements and real estate investments pouring into Lewiston. He is an early and continuing pioneer in revitalizing this small but vibrant city. We asked him what properties he renovated and he said, "I'll show you one; let's go upstairs." He took us to a condo in the building he recently sold. It was fit for a king and queen. -4,000 square feet of top of the line quality with a huge living room, 30-foot-high ceilings with skylights, gorgeous woodwork, a kitchen with huge granite island, a private elevator-- and all at a fraction of the price a similar condo (if you could find a similar condo as this one is unique) might sell 40 minutes down the road in Portland. The next morning we jumped onto our bikes for a pleasant seven-mile bicycle ride to Nezinscot farm, in Turner. Part of an old farm outbuilding was transformed into a rustic lunch spot. All our food was fresh from the farm all around us, and delicious as we sat outside and looked over the pastoral view. Gabriella Russell, a passionate advocate of developing Lewiston. She told us that the price of feed for her cows doubled from last year but the wholesale price she receives for milk remained the same. 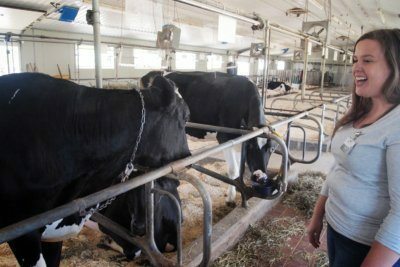 She said many of the remaining dairy farms in Maine cannot survive and will fold this year. She is trying to keep her farm operating but it is tough. When we left her to her many chores we felt if anyone can make it through these tough times it is Gloria Varney and we will check back on her next year. After lunch we walked about the farm to peak in on some of the animals who peeked back: cows, goats, horses, donkeys and some other animals this city kid couldn't name. We stumbled into the farm owner, Gloria Varney. Despite the rigors of running a restaurant, a gift shop, a large working dairy farm, raising 4 kids and who knows what else she happily took the time to chat. One cannot help but notice from most any vantage point in Lewiston the twin spires of the Peter Paul Basilica. 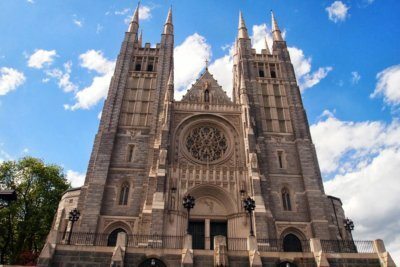 The Basilica looks like a cathedral in France. We had to investigate. We learned from a local that it seats 10,000 people! It is the French Canadian church. It was built in the depression and money was collected for it by volunteers knocking on doors in the French section with small buckets asking for a dime-- hence the origin of the charity March of Dimes. We tried the massive front doors to gain entry. All were locked. However we spied an elderly couple, speaking French, exiting a side door. We snuck in and climbed the stairs into the huge cathedral. Truly astounding to see. Breathtaking lighting streaming thru hundreds of blue stained glass windows. Rachel from the LA Museum shows us the machine her father once worked on in Lewiston Maine. We had the cathedral to ourselves. We climbed up to the 2nd floor and looked out from the organist viewpoint. Next we saw a ladder headed up into parts unknown. Feeling a little guilty and a lot inquisitive we climbed. One flight up to a small concrete landing. Two flights. Another deck. Three flights up and we were in a room with huge cathedral bells. Knowing we might have a hard time explaining our presence to the police, or worse, a priest, we descended and escaped out our secret exit. Before dinner on Thursday, we popped into one of two downtown craft brew houses in town. Chris at Baxter Brewing, located in one of the rehabbed mill buildings, spoke highly of the brewery's belief in the eco-friendliness of cans. Their brews were tasty and the cans do a good job protecting their contents! After all the climbing and excitement our stomachs demanded attention. So off to a highly esteemed restaurant called Fishbones located in the Bates Mill. We loved this place! Ambiance- great. Open floor plan in a beautifully restored mill space with huge beams and great woodwork throughout. Our table by the window looked out onto the canal. Another delightful waitress. We told her what we had been doing and who we met and she knew everyone we knew and recommended a few people we should still meet. We said we were going to Guthries after dinner to listen to music and she told us to say hello to her son who works there. We told her we were having breakfast the next morning with Mayor Jonathon Labonte of Auburn. Of course she knew him too. She recommended a great wine and told us her secret ambition is to open a wine store. She was a delight and the food was Maine seafood off the boat that day and cooked to mouth watering perfection. A lobster stripped out of its shell and piled high. Classic! Mayor John Labonte kayaking the Androscoggin River in Auburn. After dinner let the Lewiston nightlife begin! Guthries is a small club with an intimate and cozy atmosphere. Depending on the night one can hear and see performers offering jazz, country, folk or some combination. Our entertainer was the most attractive young and talented Caroline Cotter from Portland on guitar and singing her original songs. Between sets somehow we started a conversation with her and she graciously sat down with us. She told us stories of her living in Thailand and many other places -- a true world traveler and curious about everything. Caroline and her girlfriend who also joined us gave us one more example of Lewiston hospitality. The next morning it was off to meet the Mayor of Auburn, Jonathon Labonte. We joined him at a genuine French Canadian breakfast spot Remie's for some blueberry crepes. Jonathon is the youngest mayor in Auburn history. Keep an eye on him- we saw a future big name politician in the making. He paid for our breakfast and we can't even vote for him (yet). He told us one of his many goals for the city is to improve bus and train service to Portland. He wants some of the young high tech workers of Portland to live in LA where housing is at least 30% less expensive. The best part was after breakfast. 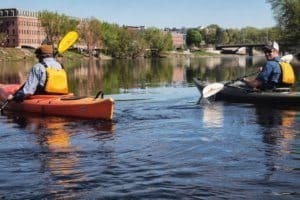 Jonathon had set up three kayaks for us on the Androscoggin River, a half a block away from the restaurant. The three of us set off and paddled up river past old mills and new hotels and people enjoying the bike path. Jonathon all the while filled in details on our sights. I could not help but notice something missing along the riverbank - no trash! In fact in the LA city our whole time I barely saw a gum wrapper anywhere. We paddled up to the Falls and turned around for a leisurely float back to our start point. What fun for us this mayor, so enthusiastic about LA and its renaissance, took the time to bring us on a scenic paddling adventure. About halfway between Lewiston and Portland in New Gloucester we discovered a most inviting place: Pineland Farms. This nonprofit farm offers so much to the visitor: an excellent luncheon spot, an elaborate gift shop, miles of hiking, mountain biking, and cross country ski trails, all sorts of barns and animals to investigate (cows, chickens etc. cheese making, workshops on farm things (ice cream making, butter making) and lots of activities for kids. Our guide milked a cow for us and let us try it - we declined. She told us of the fascinating history of the place (former mental hospital) and how as an abandoned and deteriorating place along came a patron with deep pockets: the ex-wife of Robert Noyce, the inventor of the transistor and founder of Intel. She spread the vision and had the money to make a top quality destination offering something or several things of interest to any visitor. Megan, an educator at Pinelands, the farm center in New Gloucester, Maine. Everyone was pretty much on the same positive page about the cities, and what it would take to keep making them better. "What about those Somali's," we asked? "Oh their kids are trying so hard in school and doing so well they are in inspiration to all the other students." But what about their shops on Lisbon Street? They look kind of funny selling Somali food and cell phones and stuff? "You should have seen the area before" came the reply. They have fixed up all those buildings." "Didn't they all come over here and get on welfare?" "Maybe, but not now. Between the jobs they have and the jobs they have created they add so much to the vitality of LA" we heard. At Fishbones we asked about Fusion Restaurant. "I bet you were not happy when they opened. Who wants that competition?" "Oh no," came the reply. "Eric does such a great job. The two top tier restaurants in town brings in more patrons and we both benefit. We hope another will open." Do the Irish immigrants fight with the French Canadians? Are the Italians mad at anyone?" "Maybe 50 years ago but we all get along now." I was getting frustrated. "That young mayor Jonathon can't really know what he is doing. Any good scandals?" "He seems to be doing a great job so far" came the retort. Surely the Lewiston football team must hate the Auburn players? "We have a great rivalry for sure. But we respect each other." So we left the city, impressed with the revitalization of the mills and canals and especially the people. So many cultures and different peoples all mixed together but getting along happily and with mutual respect. A lesson for all of us. Jack Dunphy right, rides bikes, kayaks and runs a propertymanagement business in Greenfield MA. His most recent project is the Orange Innovation Center, where an old mill is being transformed for the 21st century. This is his first travel story on GoNOMAD.